With the 4th of July this week, I thought I would share with you a recipe that is popular with my inlaws. Not only does it look festive for the holiday, but it is SO EASY to make. I have seen the recipe here and there all over the blogging world, but I first tasted it when I married into my husband’s family. This cake is simple, fast and super yummy! It also looks beautiful when you cut into it. If you are in need of a festive, quick and tasty treat this holiday (or any time really) give this recipe a try! This recipe is easy, fast, beautiful and SO yummy! Bake cake according to box directions in a 9x13 pan. When cake is done, let cool for about 15 minutes. While cake is cooling, boil water in a medium sauce pan over medium heat on stove top. Add jello packet to boiling water and stir until jello is completely dissolved then stir in cold water. Using a fork, poke holes into cake. Pour jello evenly over the top of cake. Cover cake and place in fridge for 3 hours. Combine Cool Whip, powdered sugar and almond extract in a medium bowl and stir to combine. Spread evenly over the top of cake. Arrange sliced strawberries over the whipped topping as desired. Store covered in fridge for at least on hour and until ready to serve. That's really gorgeous! Love how easy it is, too! I wish my in-laws gave me recipes like this! Just add the jello mixture right away...no need to let it cool down..... Just made this today for work tomorrow !! I use a box of vanilla instant pudding in my frosting for a little extra something. It makes the frosting richer. Due you make the instand jello and add cool whip to pudding, or just mix dry pudding into cool whip? That's what I do too. It makes it do much better even!! What a fun and easy recipe! This looks AWESOME! And I love the idea of putting almond extract in the whipped topping! I bet that is seriously delicious! We call it jelly in the Uk and I haven't come across Cool Whip our supermarkets. This is a ready made whip in a tub. I would just whip some cream. Dream topping might work. Yes, you can use dream whip in place of Cool Whip. Cool Whip is already made up. And Jello is a flavored gelatin. Not sure what you would have in the UK that is similar. Be sure to add bigger holes (instead of a fork I use a straw).....and poke SEVERAL holes in the cooled cake. Works great !! Easy & delicious recipe. I've always wanted to try poke cake. This one looks so good! I love this cake! When I make it I first put a layer of vanilla pudding on before the cool whip. So yummy! This cake is delicious in so many flavors. Any flavor Jell-o comes in. I love the lime also! I leave out the 1 cup of cold water to make the Jell-O favoring a little stronger. You can also substitute sugar free Jell-O and lite cool whip to make it a dessert that has fewer calories and is a good dessert choice for diabetics. I've also used raspberry Jell-O with raspberries or orange Jell-O and mandarin oranges for a change of pace. in it but this one sounds easier and SO good! Thanks for sharing. Hi, does it make a big difference if I don't add the almond extract? Never did this poking with a fork. Always heard it was done with the handle of a wooden spoon. Want to make one for next Monday. Have the ingredients on hand. Will either serve with whipped topping, real whipped cream, or a scoop of ice cream. Yes I also learned by using the end of a wooden spoon. I add almond extract to a lot of things. I add a small amount into the cake batter, I love it in BBQ sauce.....!!! Can I use vanilla extract instead of almond? So you don't do anything to the pudding mix? Can it be instant? Your cake in the picture has the Jello applied a different way besides the fork method. Care to share? what if I use a yellow cake mix, will it be any different ? It would also be good for our Canada Day. Don't forget your Canadian fans !!! It would be perfect for that! Happy Canada Day this week! Do you add dry pudding? How would you make it with it? ? I've been making this every 4th of July, veteran's day, etc. Or anytime I can find an excuse! I tint coconut blue and sprinkle it on top of the Cool whip, for a red white and blue affect. It's a gorgeous, festive, moist cake! My mother has been making this cake for well over 20 some years. We adjusted this a little bit when it comes to the Jell-o… we use the larger 6 oz package or two 3 oz packaged boxes (any flavor, we tend to love Raspeberry) and we use one and a half cups water to boil it, then we add in ½ cup very cold water to let the temp go down bit. We also had out cake sit in the fridge for about 40 mins before added the Jell-O. Anyway, but cutting the water down in half and using more Jell-o mix.. the flavor really shines. And if you make sure your cake is cold and then add the Jell-o and water not as hot… the top of your cake is less likely to bust up and it helps set the cake a bit quicker. NEVER COOL-WHIP it until your close to serving it. do you add the dry pudding to the coll whip, or do you mix the pudding up according to box directions then fold in to cool whip? Can I make this a day in advance? This looks super yummy, can't wait to try this recipe! Can you bake the cake the day before and do the jello mixture and cool whip the next day? Will it affect the taste or texture of the cake? I make this but I call it jello cake. And I use ice cream frosting. I'm so sorry if someone has asked this question already. Is it possible to sub the White cake with Vanilla and instead of jello sub it with puree strawberries. Also I use a bundt pan will that change anything?... Your cake looks amazing! .How do you get the cake out of the pan after the jello has cooled? to make layer cake. I forgot the cold water! Is my cake still gonna be good? 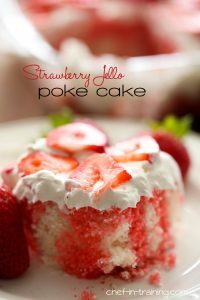 This is my go to cake for any functions I also like to spread a thin layer of strawberry jam when strawberries are not right for the winter season its adds that extra yum. You can also mix cool whip and marshmallow fluff along with almond extract for the topping. Amazing! We make this but use cream cheese powdered sugar and cool whip for the frosting. After that is beat together well we add mashed strawberries and then put on top of cake. I made this cake a couple of weeks ago after looking at several different recipes. My husband loves it and said it was the best cake he had ever eaten. Now I'm making it to go with our Memorial Day lunch. Super easy and tastes so good. We prefer it over the old fashioned strawberry shortcake recipe. Thank you so much for this wonderful recipe. This was a real hit. I all so made a raspberry poke cake and had raspberries on top instead of strawberries! Delicious. I've made this cake using a Lemon Cake mix with lemon Jello. Very refreshing when the temps outside are in triple digits. The almonds sound like a great addition to the Strawberry cake. This may be a weird question, but how long will it stay good after making? I want to make it for a potluck I'm going to on Friday, today (Monday). Easy breezy! I did the 6 oz Raspberry Jello pkt. 2 cups water to boil. 1/2 cup of cold water after the boiling. the jello over it. Poked holes were already done! Set for 3 hours, then on top had sliced strawberries. and vanilla extract. Very yummy indeed! My husbands aunt makes this for the 4th of July, but she makes a three layer cake. She does a berry blue jello poke cake on bottom and a plain white cake in the middle and a strawberry poke cake on top and then covers in whipped topping. On top she puts strawberries and blueberries .